Acura releases the third-generation RDX. The Acura RDX is one of two crossovers from Honda’s luxury brand. Acura doesn’t have the model depth and breadth of Audi, BMW, Lexus or Mercedes-Benz, but Honda’s luxury line does quite well with the six models it does offer. Further, while some of its competitors are losing market share, Acura is still gaining. Some of the credit should be laid in front of the RDX, a compact utility vehicle that’s all new for 2019. No, the model name isn’t new, but the generation is. Indeed, the 2019 model kicks off the third generation of Acura’s compact crossover utility vehicle. 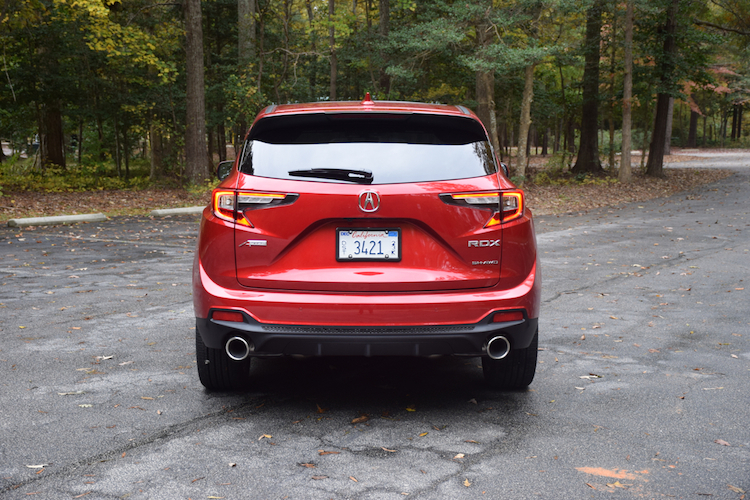 Acura classifieds the 2019 RDX as a compact luxury SUV and it is. This model competes against the Audi Q5, BMW X3, Mercedes-Benz GLC 300, Cadillac XT5, Lexus NX, and the Volvo XC40, among others. In other words, this Acura is the entry-level utility vehicle for the marque. 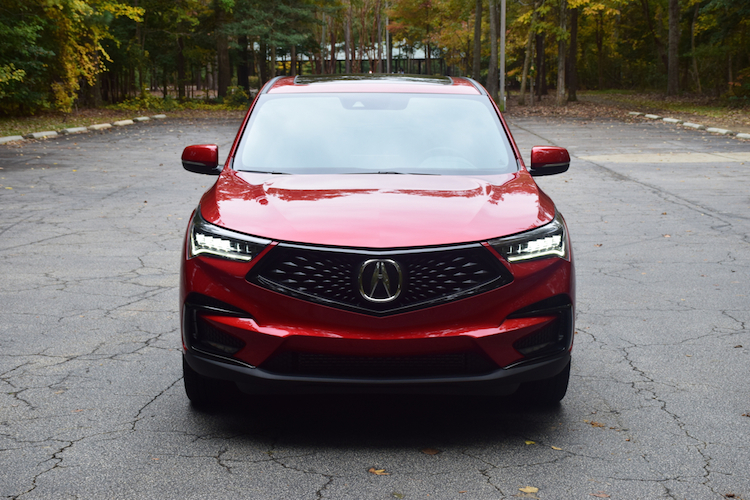 As is typical for Acura, the 2019 RDX is offered in one trim, with a starting price of $38,295. From there, you’ll opt for various upgrades and packages, including Super Handling All-Wheel Drive ($2,000). You also have a choice of a Technology Package ($3,200, 19-inch pewter gray metallic machine-finished wheels, perforated Milano leather-trimmed sport seats, GPS-linked climate control, rear doors smart entry key, a 12-speaker audio system, navigation, blind spot information system, rear cross traffic monitor and front and rear parking sensors). Or, you can choose the Advance Package ($4,900) which builds on the Technology Package. This package adds LED fog lights, 19-inch alloy wheels, a remote-operated tailgate, head-up display, heated and ventilated 16-way power front seats, heated outboard rear seats, and a heated steering wheel. The A-Spec and Advance packages are an either/or proposition. The all-new RDX sits lower and wider this year and is slightly longer overall. Its big diamond-shaped grille is an eye pleaser and a strong improvement over the previous layout. Its silhouette suggests a vehicle always in motion and that’s not something easy to pull off in a crossover. Front to back, the Acura RDX has pleasing sheet metal with strong shoulders, a gently rising beltline, big wheels and a falling roofline evident. Creases, body indentations and carefully placed trim (on some models) enhances this model’s sporty look. It marks a strong improvement over the previous model and makes the RDX a better performer in a highly competitive segment. Standard features include LED lights, 19-inch painted aluminum-alloy wheels, a panoramic moonroof, and dual exhaust tips. Upgrades include LED fog lights, 20-inch wheels, a rear camera washer, large-diameter exhaust finishers, and special exterior garnishment. With room for five, the RDX envelops its passengers in an elegant and modern interior. The front seats are quite comfortable and offer ample support. 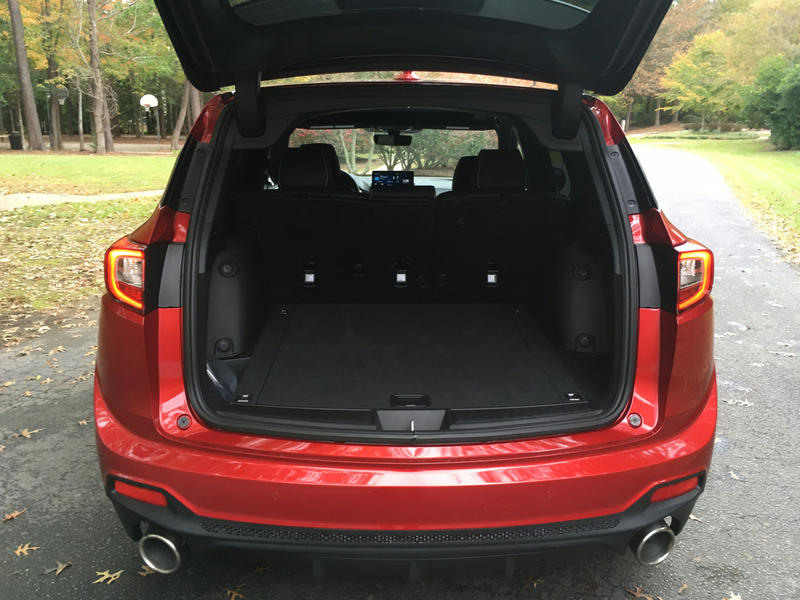 The rear bench seat is ideal for two, but manageable for three in a pinch. If your family is growing, youngsters will find ample space available. Growing teens might complain about the legroom, however. Kudos to Acura for supplying a generous 31.1 cubic feet of storage space, which expands to a whopping 79.8 cubic feet with the rear seat folded. Lots of high-end materials and excellent fit and finish mark the cabin. The center stack is clean and orderly, but take note of the transmission shifter in the stack — it is an assembly of switches and buttons that take some getting used to. Indeed, to go in reverse you must pull the marked switch toward you. If you want to go forward, press the D/S button. To park the vehicle, press the P switch. Yes, more than once I pushed or pulled the wrong button or switch, but without an incident. There were also a few times when I pressed the D/S button instead of the start/stop button in an attempt to activate the ignition. Personally, I don’t like this arrangement — it is fancier and more confusing than it needs to be. Standard features include keyless entry with push-button start, a tilt-and-telescopic steering column, dual-zone climate control, imitation leather seats, and heated and power-controlled front seats. 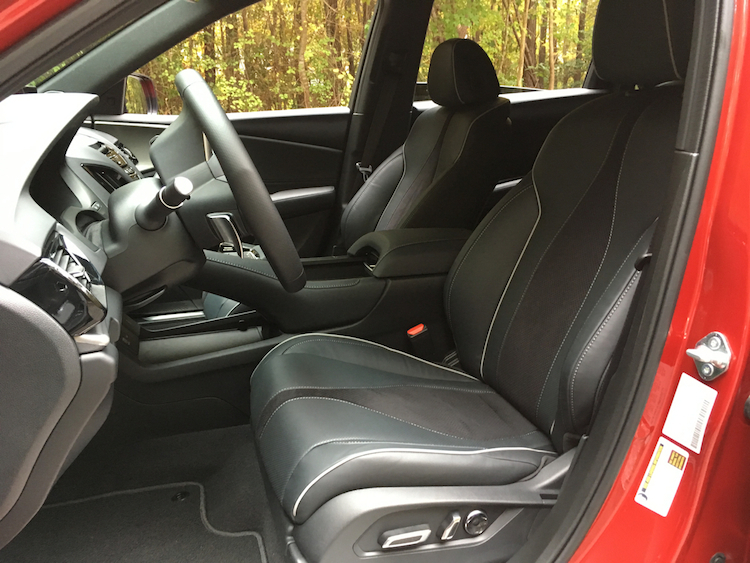 The options list includes full leather seats, a heated steering wheel, heated outboard rear seats, and brushed aluminum or real wood trim. 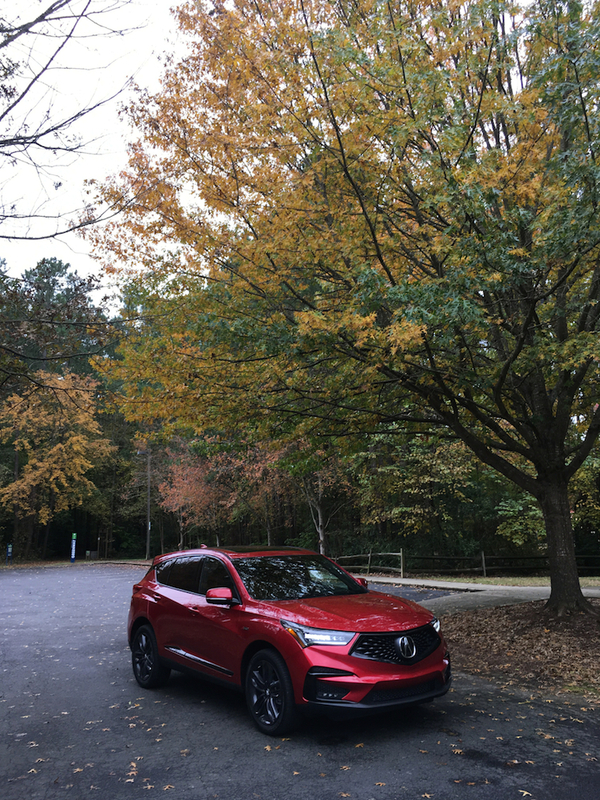 Acura has a strong reputation for technology and the RDX does not disappoint. We already drilled down on the package details, which reveal that Acura matches or exceeds what the competition offers. The standard audio package includes nine speakers, but you’ll also find 12- and 16-speaker options. All three audio systems include satellite radio, HD Radio, cloud-based services, and Apple CarPlay compatibility. If you’re looking for Android Auto compatibility, Acura says that it will be released later, pending Google compliance. Check with your dealer about having it added to your vehicle after purchase. AcuraWatch represents a suite of driver-assist technologies, including front and rear parking sensors, rear cross traffic monitoring, a blind spot information system and a multi-angle rearview camera. The latter provides an even wider view of what’s happening behind the vehicle, a feature we like. The list of available features includes a head-up display and a surround view camera. 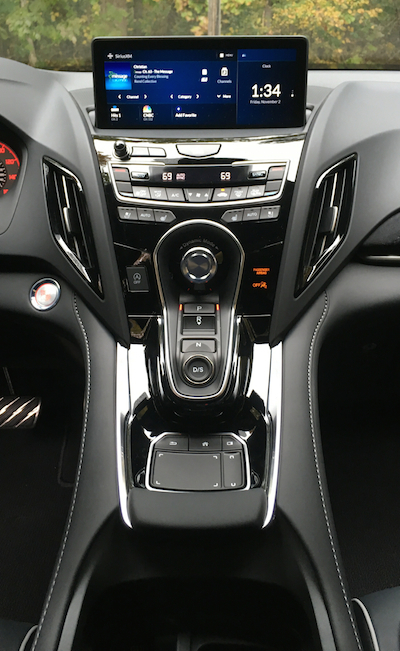 Last year, the Acura RDX was powered by a 3.5-liter V6 engine paired with a six-speed automatic transmission. Beginning in 2019, the RDX has a turbocharged 2.0-liter inline four-cylinder engine mated to a 10-speed automatic transmission. The new engine’s footprint is obviously much smaller than the second-generation model’s engine, but the power output is similar. Where the previous engine made 279 horsepower and 252 pound-feet of torque, the new engine delivers 272 horsepower and 280 pound-feet of torque. Further, peak torque is reached across a wide band ranging from 1,600 to 4,500 RPM. Acura utilizes direct injection, a low-inertia turbo, an electronic wastegate and valvetrain technology to deliver an engine that excels in power density and performance. Further, turbo lag is kept to a minimum and is nearly imperceptible under most driving conditions. You’d be forgiven if you thought the RDX had the previous engine as the amount of power at the ready is robust. 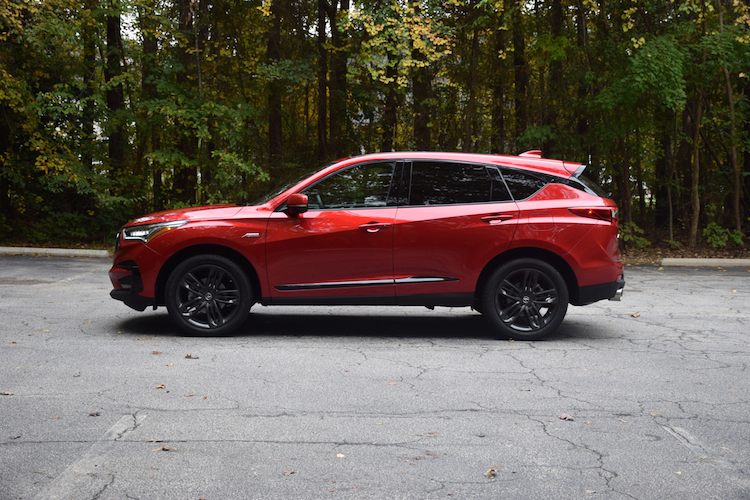 The 2019 RDX’s engine is willing and capable — under hard acceleration, the turbo quickly spools to deliver copious amounts of power. The drive mode selector knob (located above the transmission shifter in the center stack) is worth examining closer. Besides normal and snow modes, you’ll find sport and sport+ modes, the latter bringing this crossover’s performance prowess to its zenith. The “super handling” part of the all-wheel-drive system immediately becomes apparent, especially on twisty roads where up to 70 percent of the power shifts to the rear wheels (or 100 percent to one rear wheel for added stability). Along with weighted steering and engaged handling, the RDX drives like a car under most circumstances. Even those twisty roads revealed just how well planted this crossover is despite its high profile. Body lean simply is not a significant issue. I’ll also give a shout out to the new transmission. It fires off gears without complaint and never makes is presence known in a bad way. You can control the transmission through the steering wheel-mounted paddle shifters if you prefer. Acura’s RDX is better than ever and keeps this model strongly relevant in its segment. Its sporty look, especially in A-Spec guise, robust powertrain and available torque-vectoring all-wheel-drive system are among its strongest attributes. We like the interior, although the transmission shifter layout earns it a demerit. A quiet and elegant cabin, lots of tech choices and ample storage capacity are other strong points. I would be remiss if I didn’t mention that this crossover pulls up to 3,500 pounds when properly equipped. I doubt few people will choose an RDX without at least one of the package offerings. My A-Spec tester cost $45,000, which is in line with other well-equipped models in the compact luxury SUV segment. 2019 Acura RDX photos copyright Auto Trends Magazine. All rights reserved.